Convection ovens work by circulating hot air through the oven cavity by a rear-mounted fan. These ovens are preferred by many cooks because of the even heat distribution and absence of hot spots found in standard ovens. Because of the efficiency of these ovens, temperatures can typically be reduced by 25 degrees and in some cases the time can be reduced, as well. With roasts, such as ham, the cooking time will actually take a little longer. The reduced temperature is necessary to keep the meat moist, but because ham is a dense meat the cooking time is increased. 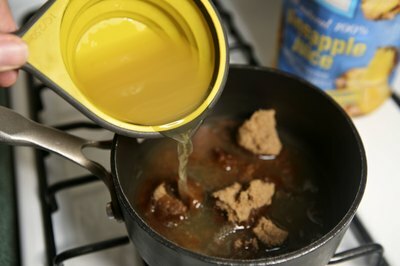 Prepare a glaze for the ham by combining 1 cup apple or pineapple juice, 1/2 cup brown sugar, 1/2 tsp. ground ginger and 1/8 tsp. ground cloves in a small saucepan. 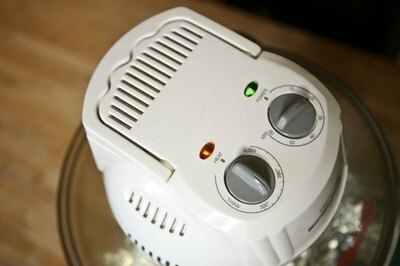 Cook over low heat for 30 minutes. Lightly grease a roasting pan or glass baking dish with olive or vegetable oil and place the fresh ham in the middle of the dish. 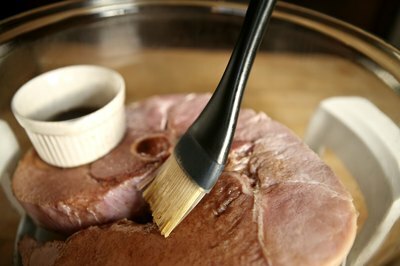 Generously apply the glaze over the top of the ham with a basting brush or spatula. 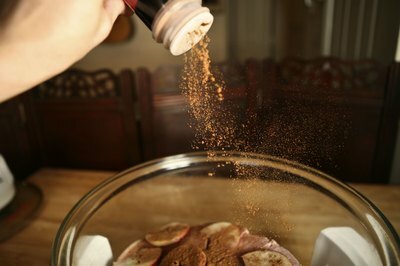 Arrange 2 cups sliced apples or pears around the ham and sprinkle cinnamon, nutmeg or allspice onto the fruit. 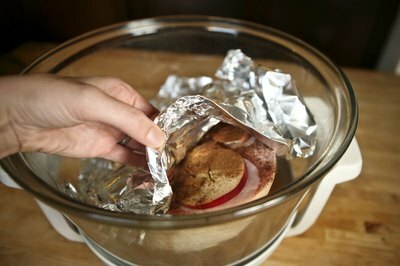 Cover the ham with foil and secure the edges around the roasting pan. The ham will remain covered for the first half of the cooking process, then finish uncovered in order for the meat to brown and make basting easier. 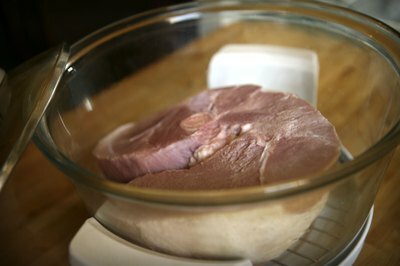 Set pan on the center rack in the oven and cook 20 minutes for a pre-cooked ham and 30 minutes for a fresh ham. Precooked hams only require heating and need less time in the oven. Fresh hams are raw, and need to be thoroughly cooked. 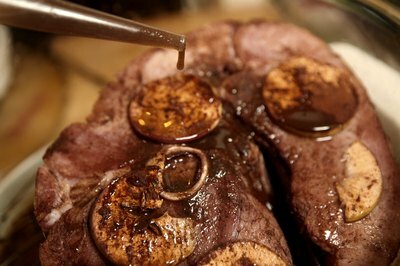 Remove the cover after 20 or 30 minutes and baste the ham with the juices that have gathered in the roasting pan. You can take the pan out of the oven for this process if it feels more comfortable to you, just be sure to close the oven door to minimize escaping heat. Use a baster or a large spoon for distributing the liquid over the top of the ham. Check the temperature of the meat before setting it back in the oven. Ham needs to be cooked to an internal temperature of 165 degrees. 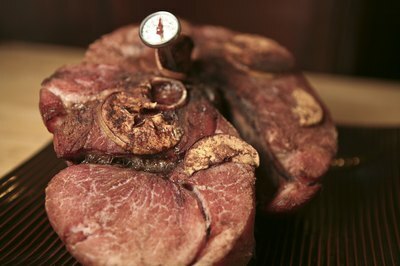 Fully cooked hams should to be reheated to 140 degrees, but can be heated to a lower temperature if preferred. Place the ham back in the oven, uncovered, and cook for another 10 minutes for a fully-cooked ham, just allowing it to brown. A fresh ham will need another 20 minutes or so before it can be pulled. Pull the ham out of the oven when it reaches 155 degrees and allow it rest for 10 minutes. 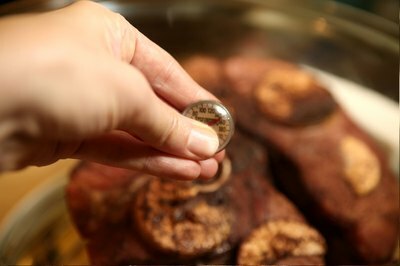 During the resting period, the meat will continue to cook after it has been removed from the oven and the internal temperature will increase another five to 10 degrees. This process helps keep the meat from being overcooked and drying out.